Connecticut River: some of the region’s best birdwatching! Whether you are a birdwatcher or not, the Connecticut River has many rare species of birds as well as common birds (Tree Swallows) that offer us the opportunity to see nature at its best! 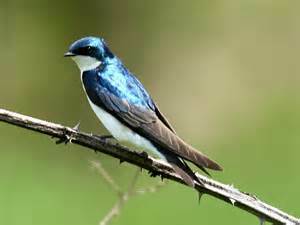 September through October: Tree Swallows - gathering every evening at sunset! Bring your binoculars, cameras and tripods as well as warm clothing and maybe something hot to drink! Tree Swallows gather on the wing in one huge, tightly choreographed flock! With dusk at hand, the aerobatic flock now shaped like a tornado swoops down into the tall reeds. It takes but 15 seconds for the 300,000 birds to vanish into the marsh and remain until dawn. Join the Islander on a leisurely cruise along the lower Connecticut River before sunset and sunset sunset and experience the tree swallow vortex on our own CT River. Boat leaves the dock one hour before sunset and will return after the viewing. The American Bald Eagle: Bald eagles and golden eagles are known to visit the warmer waters of the river to feed. They migrate south from more northern states and Canada. The eagles gather at the mouth of the river (where the river meets the ocean) or Long Island Sound, where the water’s warmer and full of fish so they have ample food to eat. The largest concentration of winter eagles' nests in the northeast region are right here in our own back yards in the towns of Chester, Deep River, East Haddam, Essex, Old Lyme and Old Saybrook.